Crushing these gorgeous baby artichokes into a pesto broke my heart. I have always wanted to make artichoke pesto but never really managed to turn the artichokes into a paste. They’re so cute and delicious as hearts that really putting them through a mixer, is something I hate to do. Today, I got the courage to do it. Here, we got something different and quite delicious. Honestly, I am not sure I will have the courage to to this again. I simply love to bite into an artichoke heart, I love the crunchy bite, it’s that simple. You could use this pesto on pasta of course, or as a sauce for grilled meats…or even to spread it on some country bread. When you’re eating spaghetti squash prepared this way, you almost forgot, it’s not pasta. I undercooked the squash to get a crunchy bite, to get the “al dente” feeling. I loved this pesto. Now for the vegan crowd, you can omit the parmesan and add more walnuts. I use very little parmesan to enhance this pesto a tiny bit. 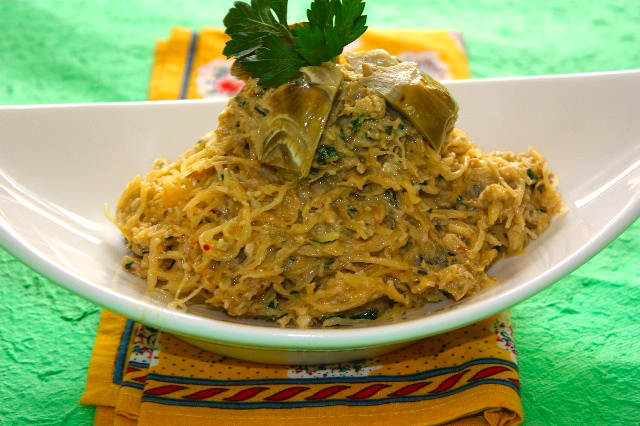 You don’t want to add too much cheese either and overpower the natural delicious flavor of the artichokes. This pesto tends to be lighter than regular basil/pine nuts pesto, its texture is more dense too, so I added a few tablespoons of water to make it creamier. I am flying tomorrow for France, to go see my father who had a stroke last December, so I will try to post a few local recipes, in the meantime, have a nice and colorful June. Cut the squash lengthwise, wrap in parchment paper and cook in a pre-heated oven at 400F for about 45 minutes to an hour. 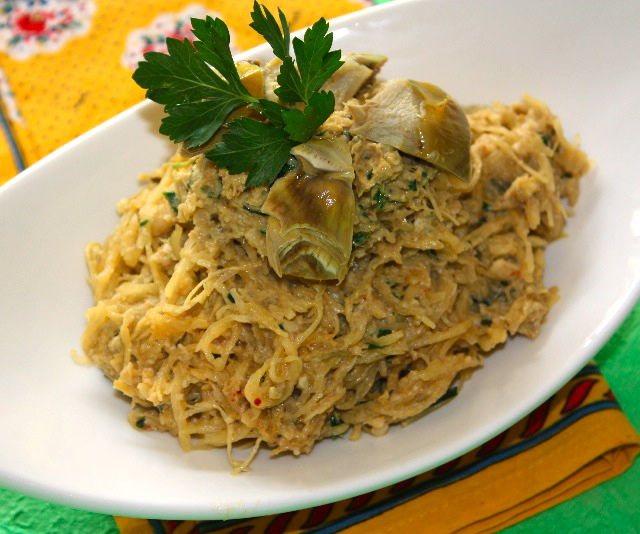 Heat up a pan, add the crushed garlic, stir and add baby artichokes cut in quarters. Adjust with salt and pepper, add 2 tbs white wine, and cover, decrease heat and let cook until tender. Let it cool. For the pesto, mix artichokes with all other ingredients a mixer. Adjust with water if the pesto is too thick. Add pesto to the spaghetti squash and mix well using your hands, to coat the squash with the pesto. 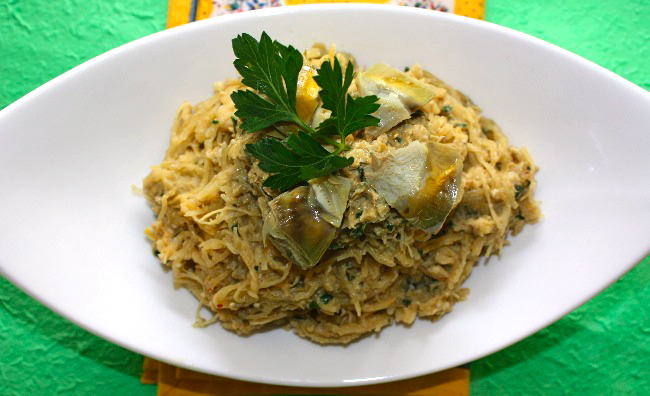 Serve with an extra tablespoon of pesto on top and four artichokes quarters on each plate. This entry was posted by silvia on June 8, 2011 at 2:12 am, and is filed under Side Dish, Vegan, Vegetables, Vegetarian - dairy. Follow any responses to this post through RSS 2.0.You can leave a response or trackback from your own site. J’adore cette façon de manger la courge spaghetti! I hope you have a safe flight and a good trip. This looks and sounds so delicious. My mom did this with squash when we were growing up…so very good! Thank you for sharing another inspired recipe. I hope you have a wonderful start to your week. Hugs and love from Austin! I love the dea of making pesto with artichokes!!!!! Love spaghetti squash and its versatility too! Lovely dish. Not much changes. Have a fantastic time with your father. All the best to you and your family. I have never tried spaghetti squash before. It looks fabulous on the serving. Yumm… Thanks again for sharing such wonderful dish. Artichoke pesto sounds wonderful, but I agree the artichokes would be difficult to put into a mixer! This artichoke pesto looks delicious! I am going to try it!